I have been busy making Christmas presents and I wanted to share what I made for my Dad. It didn’t come out as perfect as I was hoping, but I think he will still like it. Excuse the dirty golf balls, they were the only ones I could round up on short notice. As you can see it’s a golf ball display. My Dad has one already but it’s full so I thought it would make for a nice present to make him another one to hang next to it. 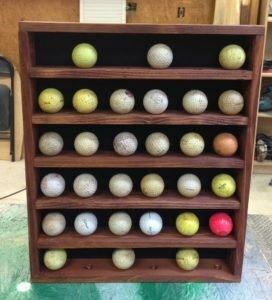 It can hold 36 balls total and is 15″ x 18″. A friend gave me a cedar pallet a while back and I have just been storing it. Since I didn’t want to use plywood for this project, I figured it would be perfect for this job. 1) First thing I did was cut up the pallet and sand all the boards down with 100 grit sandpaper. 2) My Mom (hi Mom) (sorry folks, she has been asking for a shout out and moms get what they want around here) took some measurements at their house and told me to make it 18″x15″. So I started off by cutting four strips of 2″ each. Then I cut two boards to 15″, then two to 17″ (since I’m working with 1/2″ wood). 3) Next I joined them together using my Kreg pocket jig. Note: If I were doing this over, I would use my nail gun instead of the Kreg only because it’s such a light weight object it doesn’t need the strength of the pocket joint, and since there is no place to hide the pockets it’s more time consuming filling them in than a small nail hole. Alright, let me pause and tell you about my experiments. I wasn’t sure how I was going to make the divots to hold the ball in place so first I grabbed my router and a cone shaped bit that was about 1/4″ in diameter but it ended up leaving a cone shaped burn mark (far right). Next I tried a 1″ paddle bit (far left) and even though I was happy with the size and how accurate I could get with it, I didn’t like the hole in the middle. 4) Now that I had a direction to go in, I cut 5 boards that were 14″ long, and ran them through my table saw to make them 2″ wide. 5) Then, using a tape measure I found the middle of the board (1″) and drew a line the length of it. 6) Next I placed my marks for where I wanted the balls to be placed. If you want to use the same placements as me, my marks fall at: 1″, 3 3/8″, 6″, 8 1/4″, 10 3/4″, 13″. 7) I stuck the bit in my drill press and set the depth so it would only go in as far as I wanted it to, then started making the divots. 9) Then I spaced my shelves 3″ apart and nailed them in place using 1″ brad nails. So if I’m being honest, I actually meant to round over those shelves before putting them in place. I got carried away and just kept moving and didn’t realize it until they were installed. Bummer. 10) Next, I grabbed some 1/4″ wood and cut a piece for the back. Then I also grabbed some black felt and cut it to the same size and glued it on top. Here is how it will look….. But! Before you attach the two, you need to stain it first. 11) So next I stained. 12) Then finally I attached the back to the body using 1″ brad nails. Learn from this mistake too and really take your time getting those divots exactly on your mark so the balls line up in a perfect vertical line. 13) The last thing I did was put two picture frame hangers on the back. One on the left corner and one on the right. I’ll post more pictures after I give it to my Dad and he hangs it up.